Click on photo for Biltmore link. Spring is one of the best seasons in North Carolina. The beautiful flowers, flowering trees and shrubs are sure to put anyone in a lighthearted mood. It’s a great time to walk around the neighborhood or take a drive and enjoy Nature’s beauty. In Asheville, it also brings the return of Festival of Flowers, the Biltmore Estate’s annual celebration of Spring, which happens each April through May and features floral décor focusing on a special theme for the year's event. More than 100,000 tulips are in bloom at the Biltmore’s main entrance, the Walled Garden, and elsewhere around the estate. A 20-acre azalea garden, native and exotic blooms in the natural gardens and along the walking trails are highlights of this estate-wide event. Festivities include music in Biltmore House and at other locations on the grounds, tips from Biltmore gardeners, wine tastings, grape stomp, behind-the-scenes production tours at the winery, and special anniversary menus, drinks, and desserts in Biltmore’s restaurants. Antler Hill Village opened to visitors in May 2010. It offers live music each afternoon at the Bandstand on the Village Green and farm-life demonstrations at The Barn on weekends. If Easter falls during festival time, the Biltmore Estate hosts special holiday activities that include an Easter Sunday Egg Hunt for children and visits with the Easter Rabbit. Children’s entertainment featuring music, stories and Magic Shows. Antler Hill Village also features special activities that day. The Biltmore Estate in Asheville, NC, is a National Historic Landmark with America’s largest home, gardens, winery, restaurants, and a luxury inn on the site. 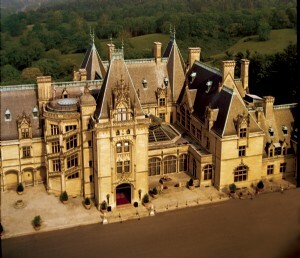 Due to the large number of visitors, reservations are required to tour the Biltmore House. The first and second floors of Biltmore House are wheelchair accessible, the basement, third, and fourth floors are not. In the gardens, the Conservatory and Walled Garden are wheelchair accessible. The Winery and Antler Hill Village are wheelchair accessible. Accessible parking is available on the grounds. The Biltmore Estate is open 365 days a year. For more info: Phone for ticket and general info: 800.411.3812 or 828.225.1333.